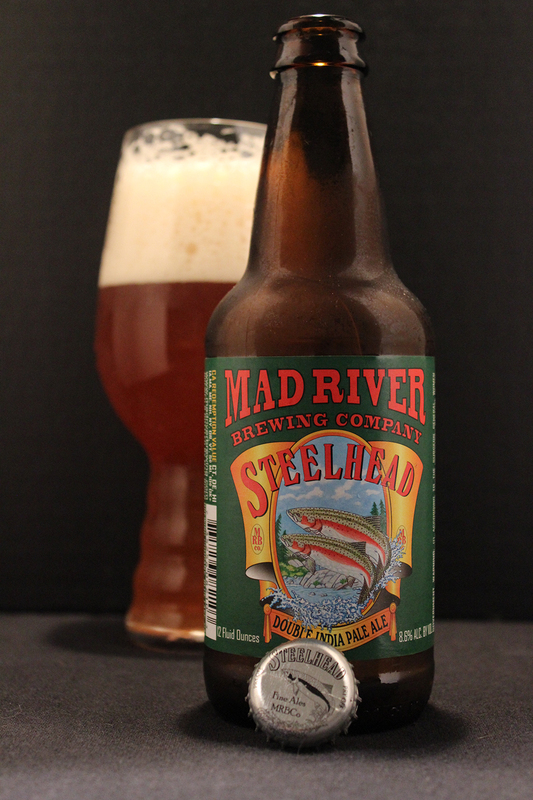 This double IPA was my first encounter with Mad River Brewing Company. I was happy to have picked this up at a friend’s place who had a bunch of different beers that were brought back to Texas from Colorado. Mad River Brewing is actually from California though, but it was brought back in the same shipment with other beers from Colorado. After doing some research on this brewery, I see that they make 3 main series of beers, the Jamaica Brand (Red Ale, Sunset IPA, Flor De Jamaica), an Artisan Reserve Series (Several beers released throughout the year), and the Steelhead Brand (Extra Pale Ale, Porter, Extra Stout, Double IPA). The Steelhead brand labels all look the same except for the outer main color, but they all feature art of two Steelhead fish jumping out of water. Nothing very exciting or eye catching, but I still picked it up due to the fact that it is a new beer to me. Poured into the specialty designed IPA glass by Spiegelau, this Double IPA appeared thick looking with a bright orange color. I don’t know if this beer was bottle conditioned or not, as it did not say on the label, and I know this beer was definitely not old when I drank it, but there was a lot of “floaties” in this beer. There was a very thick 3 inch white foamy head which topped this beer with good retention throughout the session. It did dwindle down to about a quarter of an inch, but it did hang around for a while, leaving excellent soapy spotty lacing down the glass. This DIPA (Double India Pale Ale) has has a nice aroma that is balanced well with scents of orange and lemon peel, grapefruit, floral and grassy hops, caramel malt, toffee, sweet sugar, and freshly baked biscuits. The hop aromas were upfront, as they should be with a Doublle IPA. The taste seemed to follow the nose. All the hop profiles hit the palate first with orange, lemon peel, grapefruit, floral, and grassy characters. The body was nice and malty with a strong caramel presence, followed by hints of toffee, and freshly baked biscuits. There is a nice layering sweetness that reminds me of sugar sweetener. This Steelhead DIPA has a very well balanced flavor. The body was medium in thickness with a very smooth, silky mouthfeel. Good barbonation. There is a bitter bite to Steelhead, and the beer finishes with a dry lingering feeling. Overall, this beer was a good Double IPA. It had everything that the beer needed to compliment the style. This one was slightly above average, and if I ever run across this beer again, I would definitely pick this one up. There are no plans to see Mad River Brewing Company here in TX on a regular basis, but as long as you know the right people, my fellow Texans, you will be able to get your hands on this beer.